Shoe-shining & sewing buttons: It is always dangerous when Princess and Hubby go shopping. You never quite know what they will come home with in regard to gastronomical delights to cook. This last week, Hubby came home with shoe shining equipment for Matey. I must admit, I thought he could have used Hubby’s equipment but Hubby believed it would be great for him to have his own, learn how to use it and keep it orderly and keep his leather boots shined. 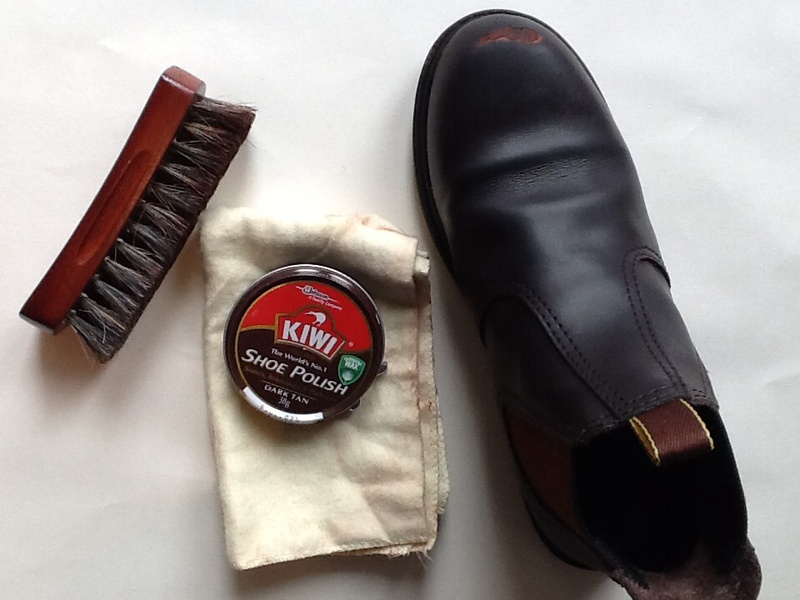 Matey took it seriously and did a great job learning to shine his shoes. 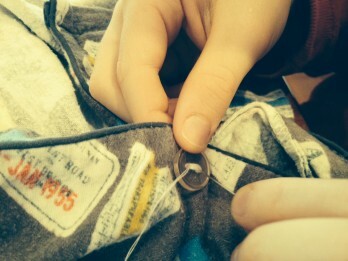 Princess already knew how to sew on a button but I taught Matey this week and had them both sew the buttons on our pyjama tops that needed replacing. Have you ever thought of compiling a list of tasks that it would be great for kids to learn before they reach 18 years of age? Things like shoe shining and sewing on a button. It doesn’t take much to show them. They are only small tasks but they are skills that go untaught a lot. Movies: Before our DVD player broke last week, we had borrowed the ‘Anne of Green Gables’ DVD from the library. I couldn’t remember much of the storyline and Princess wasn’t that keen on it but after the first little while, our whole family was hooked. Unfortunately due to the DVD machine just not working anymore, despite what we try and do, we haven’t been able to watch the sequels. Princess hates suspense (so much like me) so she googled whether or not Anne married Gilbert. The books have all been subsequently borrowed from the library. We also watched the Huckleberry Fin movie which they loved. Thus, the ‘Huckleberry Finn’ and ‘Tom Sawyer’ books have started coming out. Adventure bike ride: Matey and Hubby have been trying to go adventure bike riding every week. Last week, they rode through the hills of Red Hill with a mate of hubby’s. Hubby admitted he struggled to keep up with Matey and his friend. They came home covered in mud but having loved it. Matey’s bike riding skills have really improved and he loves it. It is also something that he looks forward to every weekend. This last weekend they went on another ride whilst Princess rode 26km on her bike with her friend so as to encourage her friend who is training for a HPV (High Performance Vehicle) event at school. Working with dad: Matey was allowed to go to work for the day with Hubby last week. Matey loves it. I am not sure if Hubby’s employees think the same as Matey is apparently a real chatterbox at work and some of Hubby’s crew suffer with depression. Matey always manages to be in the middle of the action, but in a general weeding and garden cleanup day, without chainsaws, it was relatively safe. Matey loves getting in and helping. He has a gift of serving. There is something about a son helping his dad at work that so encourages the son. It also gave Princess and I a day to focus on her algebra, ratios, and other maths problems she had been requiring assistance with. Study of China: This last week, we tried a unit study on China. I wanted the kids to learn about China, and after researching on homeschooling sites on the web, decided on a unit study for a fortnight on China. It was great. We can recite the 14 countries’ names which border China, including all the “…stans”. We watched “The Inn of the Sixth Happiness” yet again about Gladys Aylward, a missionary to China. We read one of my childhood favourite books, “Ping”. We watched Youtube clips, made the ‘Great Wall of China out of Lego, flicked through travel brochures on China and planned a holiday and did numerous other things. I had a great time and learnt a lot. The kids did too. We didn’t actually make and eat any Chinese food since Princess is co-ordinating the menu at the moment and we normally eat fried rice and sweet and sour chicken a lot and go out to a Chinese Restaurant for special occasions. Matey even initiated the ABC game on countries of the world. We also listened to and tried to learn a song naming all the countries in the world. At the moment, I am planning to focus on Asia for awhile, but I will let the kids choose which country they want to learn about next. A funeral: A friend of mine’s husband drowned whilst surfing last week. He was only 42 and had 3 kids similar ages to my kids. It certainly affected the tone, conversation etc in our home. We all went to the funeral. (Sometimes homeschooling makes it hard when you need to do something and there is no-one else to look after the kids during a school day.) Our kids knew their kids but not that well. It was an amazing funeral. The wife and kids all spoke courageously about their husband and dad. His mates spoke a truly fitting tribute to him. They presented the gospel so well as it was just what this guy would have wanted. One of his mates had even counted the number of days this guy had been alive for and asked everyone what you wanted to do for the rest of your days. It made me think about my funeral and what I would like said at it. The church was packed. It was a significant afternoon. My friend asked me at the end of the afternoon tea to call her in 3 weeks. This initiated further conversation with our own kids about what is good grieving, what can normally happen after a death, how people rally around but can then leave you all alone in a couple of weeks etc. Cooking skills: Princess has been experimenting with cooking new things. She has recently discovered scones and pizza dough so we can make our own pizza. They turn out brilliantly. The exciting thing for me is that she is completely cleaning up after herself and also whipping the cream for the scones herself. All I have to do is turn up to eat them or put my toppings on the pizza. Bliss. The last few weeks, Princess has also been planning the weekly menu and filling out the shopping list. Eight years ago I made up a computerised shopping list on an excel spreadsheet, with the items we usually buy and sometimes buy in the order you walk around the supermarket. She prints this off, fills in the sheet according to her menu, and then goes with Hubby to shop for the items. The first week, I wasn’t quick enough to look over the menu before the rest of the activity occurred. Pizza was down twice. Each time we have it, it lasts for two nights. That meant four nights of the week were pizza. To her credit, we all eat a lot of vegetables on our pizzas, but not quite a balanced menu. Great experience for her though and it eases some of my workload. The next step is to help her work out the specials at the supermarket each week and incorporate that into the menu so as to save money. Great life skills. Loom bands: We are involved in starting a new Christian homeschooling group on the MorningtonPeninsula. It is planned to meet one afternoon per fortnight and it will be more focussed towards getting the kids to look towards serving others. This week we are having a missionary come who is home from Myanmar. On her return, she is wanting to take as many loom band bracelets as possible with her. Why? I am still unsure about this but I am sure we will find out this week. In the meantime, the kids are all encouraged to make as many loom band bracelets as possible. We have set our family a goal of making 100 loom bands this week. Currently at the 52 bracelet mark. If you have a budding loom band bracelet maker, feel free to make as many as you like and send them to us. We will make sure they get to Myanmar. Perhaps we also need to study that country next as well whilst we are doing something practical for the kids there. Books read this last fortnight: apart from books about ‘Anne of Green Gables’ and ‘Anne Frank’, “Hidden like Anne Frank” etc. They have both loved re-reading “The Box Car Children” comic version. I must admit, they are a great series. Matey wishes he could be part of their family and have adventures like them. Matey (aged 8) has been reading out aloud to me from the ‘Car Mad Jack’ series. They are very funny. We also discovered the non fiction section at the library on the royal family so Princess has loved that. Also, I was pleasantly surprised in the non fiction section on World War 2 some great books about children during the war. Also, the ‘Berenstein Bears’ and the Richard Scarry series on ‘Huckle’ have made a comeback in our home. These books resurface every little while. My kids love reading and never seem to tire of re-reading books. Princess has also been captivated by doing Suduko’s. I find these great and she has enjoyed the challenge as well. What have been your fortnight’s highlights? What new things is your family implementing so that you can raise well rounded world changers? Thanks for another encouraging post. Just wondering, when would you need the loom bands bracelets by? Thanks Kaidee. We met Ruth today who is going to Myanmar (Burma). A bit different to what I thought as she is not a long term missionary. Her & her husband take a team every January to help out at different orphanages and to help the extremely poor kids in the shanty town by the railtracks. The kids over there love receiving something and the loom bands are small enough to take and it means each kid gets something of their own that they can keep that is theirs. She would love to take 600 bracelets. Our family is committed to making at least 100 bracelets. She needs them by the beginning of December. (~1 per day between now & then) If you email me at [email protected] I can give you our postal address. So glad Princess is into Anne books … my favourite when young and I have them all! R has also read and reread them all … but I must warn you, the miniseries butchers the books in the second series and so if you watch them enjoy them for what they are … not true to the Anne books but a fun watch regardless! Our R is now working through the Narnia series … thoroughly hooked! We must get onto the movie The Inn of the Sixth Happiness! Thanks. Princess has actually reminded me several times now, “isn’t the day you are meant to call F (my friend) Monday fortnight” etc and has written it on the family planner. It has obviously impacted her.